One of the most frustrating issues about being a dog owner is when your dog suffers from some form of allergy. One of the most common allergic ailments that your dog might suffer from is atopic dermatitis. 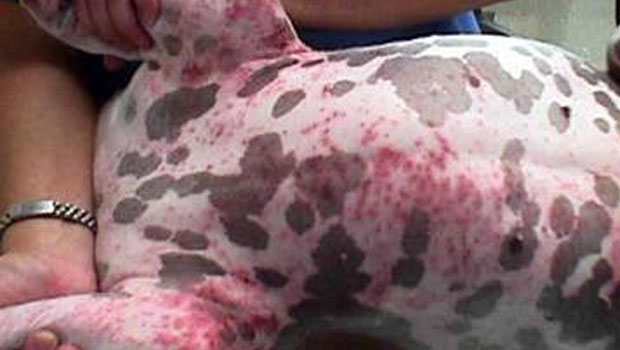 Atopic dermatitis is usually provoked by common allergens that typically affect dogs in the environment. Dogs are usually sensitive to environmental allergens like dust mites, fleas, pollen, and dander. This might leave you wondering if there is anything your dog is not allergic to. Although allergies can affect any dog breed, Atopic Dermatitis is mostly genetic. Dogs with this condition should, therefore, not be bred. Since this condition is genetic, many dog breeds have a predisposition to Atopy. 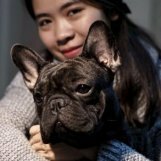 These dog breeds include Miniature Schnauzers, English and Irish Setters, Labrador and Golden Retrievers, Shih Tzu, and Cairn Terriers. When dogs suffer from this disease, they may start showing signs when they are between 3 months and 6 years of age. However, sometimes Atopic Dermatitis may fail to become clinically apparent within your dog’s first three years. This is because it usually starts as a mild condition. Once you suspect that your dog could be suffering from Atopy, you should take him to your vet. Your vet will conduct a physical examination of your dog to determine the underlying cause of the skin allergy. Your vet may require you to provide him or her with your dog’s complete medical history. The vet may perform a serologic allergy test. However, the accuracy of this test will depend on the laboratory in which the test is performed and how the results are analyzed. Intradermal testing may also be performed on your dog to identify the cause of your dog’s allergy. The intradermal test involves using small amounts of test allergens and injecting them into the skin. The response of your dog’s skin to the allergens will be measured, and this will be used to determine the cause of the allergy. Once your vet has determined the cause of your dog's symptoms, a medical management plan is usually introduced. A combination of drugs and topical treatments are usually recommended. Oral Corticosteroids are often prescribed to reduce the inflammation and decrease the scratching. Steroids do come with some side-effects so it is important to give your dog the medicine exactly in the way your vet prescribes. Other non-steroidal drugs may be suggested to reduce the inflammation and itchiness. Oral antihistamines are also commonly prescribed in mild cases. Additionally your vet may recommend an antibiotic or an antifungal agent especially if a secondary bacterial infection is suspected. If your vet has done allergy testing, they may suggest immunotherapy. You have no doubt heard of humans getting allergy shots. This is the same thing and involves a series of shots that contain the allergens that your dog is sensitive to with the intention of creating a tolerance to these substances. Many dog owners may prefer a more natural approach to relieving their dog's symptoms. Here are 11 remedies to try at home. 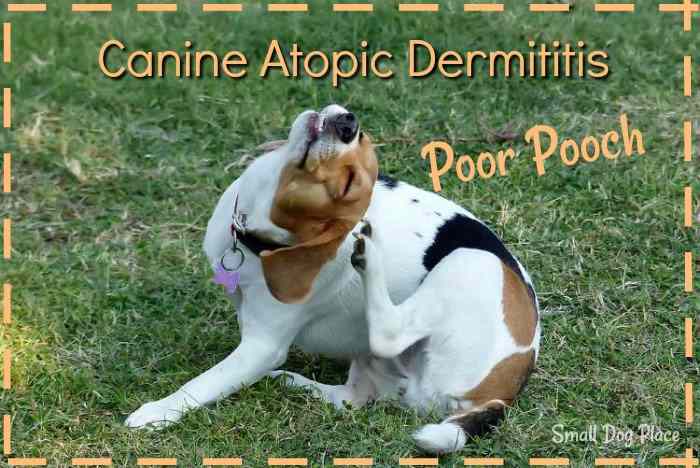 Let’s look at the natural ways through which you can treat canine Atopic Dermatitis. Food allergies can increase the scratching and itching in dogs with atopy. Therefore, a good starting point in treating canine Atopic Dermatitis is to ensure that you feed your dog on a high-quality diet. The diet should be high in protein, moderate in fats and low in carbs. Dietary items that you should avoid include soy-based products, by-products, chemicals, and impurities. You should also add supplements to your dog’s diet to provide him with valuable nutrients. Sometimes your dog’s weak immune system is the reason why he is predisposed to allergic conditions such as Atopic Dermatitis. One way of boosting your dog’s immune system is by improving their digestive health. The best way to do this is by introducing probiotics into your dog’s digestive system. Probiotics are the “good” bacteria. Many pet parents always admit seeing positive results after putting their dogs on probiotics. You can introduce probiotics into your dog’s digestive system by giving him supplements. One of the best ways of easing your dog’s allergies is through good grooming. Bathing your dog can provide some relief to your dog’s itchiness and scratching. However, you must ensure that you use a shampoo that is gentle on your dog’s skin. You can also use a homemade shampoo. Sometimes your vet will prescribe a shampoo to use. If not, you can try some over-the-counter shampoos that will soothe your dog's discomfort. Here are a couple of suggestions that are highly rated. Vitamin E is a potent antioxidant. It can also act as a moisturizer to moisten your dog’s dry skin. Since Atopic Dermatitis can cause your dog’s skin to dry, your pooch could really benefit from being massaged using vitamin E oil. If you prefer an oral medication, this one below not only includes vitamin E but also many additional vitamins and omega 3-6-9 for excellent skin health. Most of my dogs love the taste of these treats. Oatmeal is known to be a remedy for itchy skin. 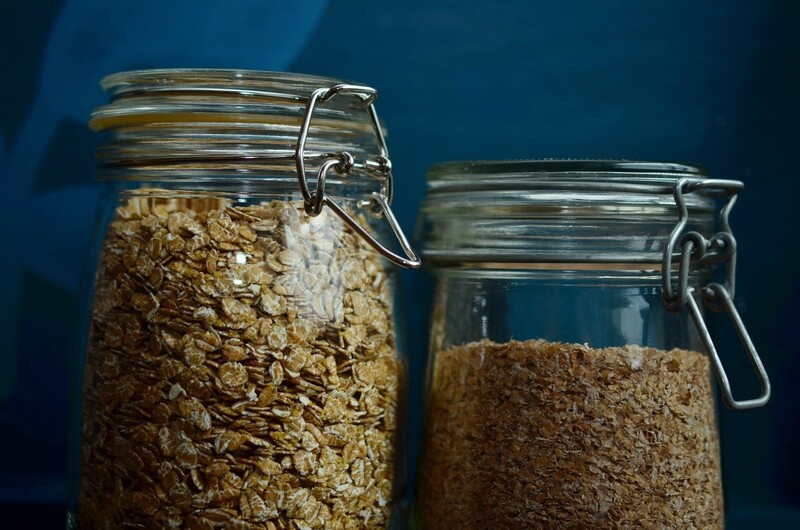 This is because oatmeal contains chemicals known as phenols and avenanthramides. These chemicals have anti-inflammatory properties. Your dog will get immediate relief if you wash him with oatmeal. You can create your own remedy by grinding the oatmeal and then mixing the powder with water. You can then apply the mixture to the affected areas. You can also add the oatmeal formula into your dog’s bathwater and wash him. If you'd like to try an oatmeal shampoo, there are many fine examples available. I recommend you use a shampoo and conditioner for best results. Canine Atopic Dermatitis may cause your dog’s skin and muscles to be sore. Epsom salts have anti-inflammatory properties that make it useful for soaking and cleaning wounds. You should mix the Epsom salt with warm water before applying it on your dog. You can leave it on your dog for five minutes and three times a day. You will need to have a sink or bathtub for your dog to soak and reap the most results. There are plenty of available epsom salts available, but if your dog is a bit feisty, choosing one with lavender will help him relax so you can achieve the best results. 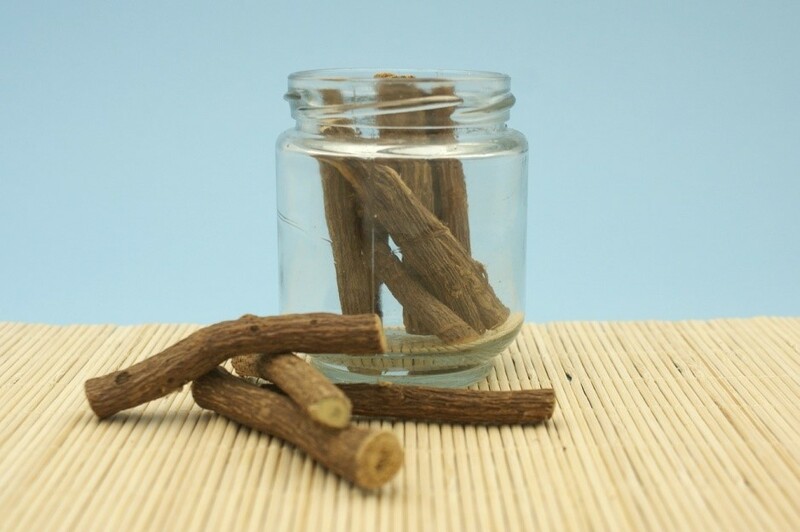 Licorice root is a form of cortisone and is known to be a relief to skin irritation. Licorice roots also reduce the urge to scratch hence will prevent your dog from causing further damages to his skin. You can find licorice roots in pet stores or other stores that sell health products. However, it is advisable that you should first consult your vet before giving your dog licorice roots. This is because licorice contains cortisone which is a steroid. Cortisone may cause some cross-reaction with any medication that your dog might be on. Other homemade remedies that can help to relieve your dog of Atopic Dermatitis include dishwashing liquid, baking soda, chamomile tea and hydrogen peroxide. You can also try some organic healing balm to treat your dog’s itchy and irritated skin. Skin soothers are one of such organic healing balms that can help your dog. Skin soothers have antifungal, anti-inflammatory and antibacterial properties all packed inside it. These ingredients are carefully sourced and will work together to treat the underlying cause of Atopic Dermatitis. It will also promote a faster recovery. Atopic Dermatitis may cause your dog’s skin to be irritated, and this may affect even the most sensitive areas of your dog’s body like the face. You will, therefore, need wrinkle bam to combat the build-up of bacteria and yeast on the affected skin areas. If bacteria are allowed to build-up on the wounds, the bacteria will create a foul odour. Since the wrinkle bam is very gentle on the skin, you can apply it on even the most sensitive skin areas. This organic, all natural, vegan product contains a natural antibiotic for soothing wounds, rashes, and itchy skin. Some of the ingredients are organic cocoa butter, sweet almond oil, coconut oil, safflower oil, sea buckthorn oil, essential oils, natural vitamin E and more. Since fleas are among the culprits that are known to cause Atopic Dermatitis, preventing them from causing trouble to your dog is one of the remedies for Atopic Dermatitis. If you don’t want to use conventional flea prevention products, you can turn to natural options. Essential oils are very useful in flea prevention. 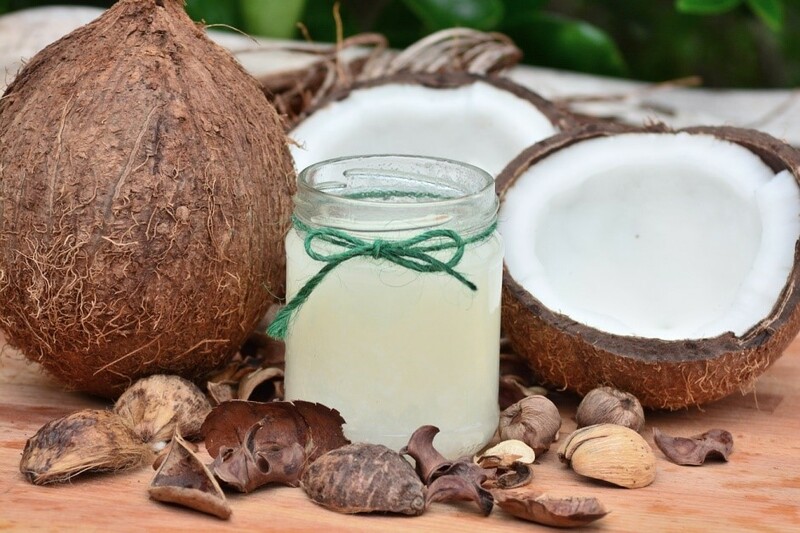 One oil is coconut oil. You can apply it externally on your dog to get rid of fleas that might cause Atopy. There are also many recipes you can use to make your own flea prevention shampoo. You can add tea tree oil to oatmeal shampoo to create a very effective flea prevention concoction that you can bathe your dog in to get rid of all the fleas from his coat. Mix all ingredients in a clean jar or other container. Wet your dog down and lather. Allow the solution to remain on the dog for about five minutes if possible. Rinse thoroughly. Do not get this solution near your dog's eyes. The skin inflammation that results from atopy can be treated by over the counter drugs. One of the best medical remedies for canine Atopic Dermatitis is hydrocortisone cream. You can buy this cream over the counter. Your vet may also prescribe to you an oral antihistamine to help relieve your dog from severe itching. Remember, If the dermatitis is very severe, then your dog will require prescription medications and/or injections to eliminate the severe itching. Allergies are as common in pooches as they are in humans. These allergies can cause your dog a lot of suffering. Atopic Dermatitis is one of the conditions that can be caused by allergens. Any pet parent whose dog has been diagnosed with Atopic Dermatitis should have a reason to be worried and should immediately take the dog for medical examination. Canine Atopic Dermatitis develops when your dog is exposed to allergens that will trigger an allergic response. This may result in excessive itching and hair loss due to skin irritation. She also has a dog named Lola.